Most dogs experience diarrhea at some point in their lives. As an owner, if you’re lucky the episodes occur outside and are short lived! 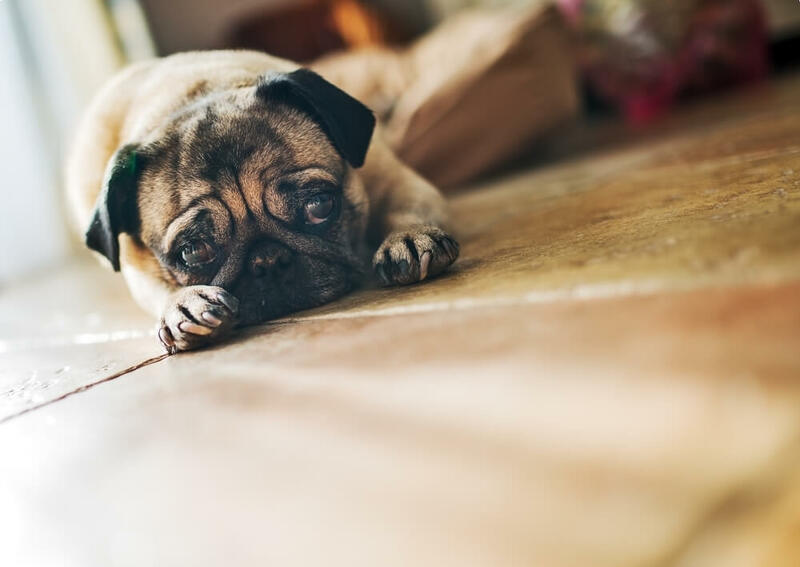 Although there may not be an immediate or obvious cause, diarrhea is typically caused when a dog ingests something that its body cannot tolerate such as inappropriate table scraps, garbage, or spoiled food. Perhaps your dog got into the trash or broke into the cupboard or refrigerator. Whatever it was it may well have consequences. All dogs have the potential to suffer from dietary indiscretion or eating something they shouldn’t but the risks are greater for young dogs and dogs that have a very strong appetite. Most cases of dietary indiscretion are mild and do not have lasting consequences beyond an upset tummy. As long as your dog is still active and there are no other symptoms that point to something more serious then you don’t need to panic. Diarrhea can usually be treated systematically with fasting followed by an easily digestible diet and a few home remedies. The immediate nutritional management of acute gastro intestinal disease usually involves short-term fasting to rest the gut. Some people say it’s not necessary, but I find it really helps to speed up your dog’s recovery. Aim to fast your dog for between 12 to 24 hours. Slowing gastrointestinal tract function by withholding food (NOT WATER) allows normal gastric and peristaltic contractions to subside and promotes healing of the intestinal lining. Short-term fasting may also help to prevent hypersensitivities when altered mucosal permeability is present. After a fasting period, a ‘bland diet’ consisting of highly digestible ingredients is usually recommended. I recommend a single source of high quality low fat protein such as skinless turkey or chicken breast and a single source of carbohydrate such as white rice or potato. Mix the protein source and vegetable – 1/3 protein and 2/3 vegetable, and feed it to your dog in 2 to 3 small meals a day until the diarrhea stops, which should happen in about 72 hours. You can also mix some psyllium husk powder directly into the food. Try 1/2 teaspoon for each 10 kg of body weight per day. If this seems to help but isn’t good enough, try1/2 tsp in each of 2 meals per day for a few days. Usually a young, healthy animal will have an episode of loose stool or diarrhea, and it’s done. Their body will expel the offending material and self correct. If your dog’s condition lasts a day or so then there is probably no need to visit the vet. However, if your dog becomes lethargic, dehydrated, the diarrhea lasts longer than a few days or they experience chronic recurring bouts of diarrhea then you should visit your vet for further investigation. There may be an underlying condition or issue that needs more specialist treatment. Puppies, small breeds and older dogs are at special risk of recurring diarrhea because they can easily become dehydrated – even from a single episode. If your dog is passing blood in his stools or is also being sick or displaying additional symptoms, then you definitely need to visit the vet as soon as possible.